Globe GOUNLI30 promo to all Globe Prepaid subscribers, for only P30 you can get unlimited call and text to all networks plus 30MB of data that you can use to access Facebook, Twitter, Google and other apps valid for two (2) days. GOUNLI30 is another best unlimited offer from Globe, if you’re having difficulties registering to Globe SUPER25, then here’s your alternative to get unlimited call to Globe and TM. 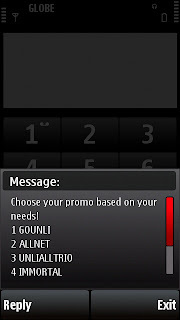 To register, just Text GOUNLI30 to 8080 or dial *143# then choose option 6 or Combo Promos. Select GoUNLI then navigate to GoUNLI30. Wait for the confirmation message and enjoy! You may also read this post about Globe Unlimited Call Text and Combo Promo List and Globe Unlitxt 20, 40, 80 Unlimited Text Promo.